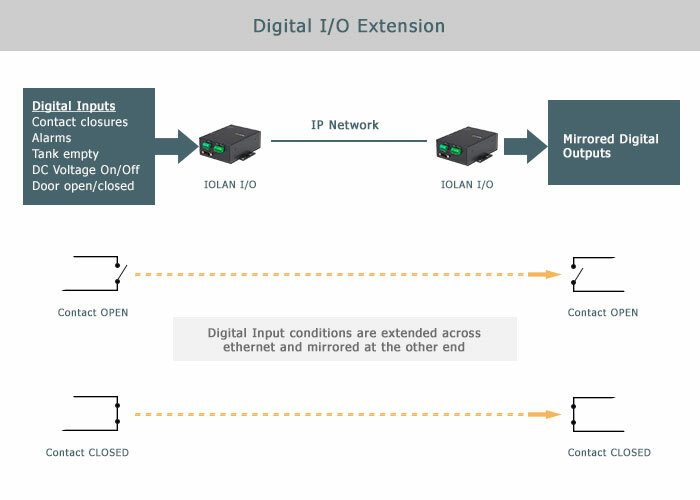 The IOLAN’s Digital I/O extension feature, sometimes referred to as I/O tunneling, provides a cable replacement solution by transmitting digital input signals to a remote output peer over an IP/ Ethernet network from PLC controllers, DCS systems or OEM equipment. Pass the state of a digital I/O input on one end and mirror this condition on the digital output on the other end. For example, a dry contact closure at one remote location can, in effect, be duplicated via a closure of a relay contact at another location using an IP Ethernet network.